Jetzt können wir euch mitteilen, das es bei Amazon.com das erste Transformers Prime: Beast Hunters Paperback bestellen kann. Zum Inhalt können wir folgendes bekannt geben: BEAST HUNTERS! They were there when Cybertron fell - but what happened to the Dinobots for the past few thousand years? Here's a hint - Grimlock and company haven't been sitting around and relaxing! The time is now - the place is Cybertron -and the recipe is ACTION!. 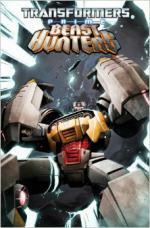 Jetzt zeigen wir euch die Vorschau zum IDW Comic Transformers Prime: Beast Hunters Heft 2. Wir haben hier 5 Seiten aus dem IDW Comic Transformers Prime: Beast Hunters Heft 2, zu denen Mairghread Scott seine Kommentare gegeben hat. PAGE 1: What's your approach to Kickback in this series? How do you make him different from other versions of the character? MAIRGHREAD SCOTT: I wanted to preserve the voice Kickback had in the FALL OF CYBERTRON videogame. It was a really distinctive speech pattern and a lot of fun to write. Beyond that, I just wanted to make him wheedle-y enough to be a fun Decepticon, but responsible enough to be a believable leader. PAGE 2: With so many fights in Transformers, how do you try and make each one a little bit different? Is it a big challenge? MAIRGHREAD SCOTT: “Who is in the fight” and “where are they,” are the most important aspects of a unique fight scene. Can someone fly? Are there narrow places in the room to hide? Also, not everyone approaches a fight the same way. I think Kickback is happy to let others soften the Dinos up for him while he uses his speed to finish them off. Someone like Grimlock would never fight that way. Whenever I get stuck writing a fight scene I go back to those questions: who and where. 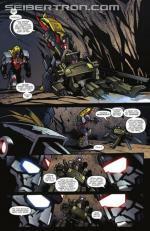 PAGE 3: What’s driving Sludge this time, after events in RAGE OF THE DINOBOTS and the FALL OF CYBERTRON comics? How has he changed as a character? MAIRGHREAD SCOTT: In “Rage” Sludge was the ’bot with no problems, which is odd ’cause he was left to die, twice. You don’t just “not mind” something like that. So in this story, I wanted Sludge to actually face his past and move beyond it. This fight is the tipping point for Sludge to do just that. PAGE 4: If you could pick a new alt mode for Sludge, what other Dinosaur would you pick? MAIRGHREAD SCOTT: An Ankylosaurus. Sludge is a more defensive-minded fighter than the average Dinobot and I’d have his tail turn into a hammer in ’bot mode. It’s always fun to have design elements multi-task like that. PAGE 5: If we go back in time and give Sludge the same choices, do you think he would still become a Dinobot or choose to go a completely different route? MAIRGHREAD SCOTT: Well none of the Dinobots had a choice in the matter. I know that Sludge would never have left his friends to go into a fight without him, but given the choice I don’t think that Sludge would have become a Dinobot. In fact, if it weren’t for the caste system and the war, I don’t know that he’d have become a soldier at all. Explore the rich world of Transformers Prime! Loaded with character animation models, concept art, interviews with the creators and more, Transformers: The Art of Prime provides an unprecendented look behind the scenes of bringing the TF movie universe to the small screen. Jim Sorenson (Transformers The Ark, Transformers AllSpark Almanac) brings this deep, vivid world into focus! Heute können wir euch die Cover zu den beiden Transformers Prime Beast Hunters Comics Heft 5 und 6 zeigen. 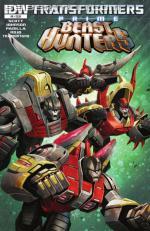 Jetzt können wir euch das Cover zum IDW Comic Transformers Prime Beast Hunters Heft 3 zeigen. Dazu haben wir auch ein Inhaltsangabe für euch. THE BEAST WITHIN! After the Fall of CYBERTRON, GRIMLOCK and his DINOBOT allies are tasked with protecting the last remaining Cybertronians from the dangers of the demolished planet. 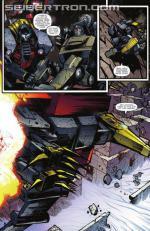 But as time passes, GRIMLOCK grows more and more uneasy with the rage and power that he's forced to hold back. Can the AUTOBOT leader learn to control his power or will the beast take over? Jetzt haben wir die Vorschau zum IDW Comic Transformers Prime Beast Hunters Heft 3 für euch. 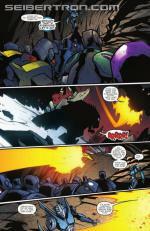 Hier haben wir die Vorschau zum IDW Comic Transformers Prime Beast Hunters Heft 4. 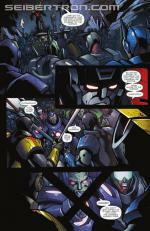 Hier ist die Vorschau zum IDW Comic Transformers Prime: Beast Hunters Heft 5. 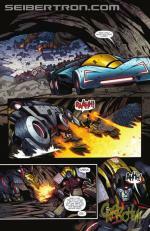 Hier haben wir die Vorschau zum IDW Comic Transformers: Prime Beast Hunters Heft 6 für euch. Im März 2014 wird das zweite Sammelband zu Transformers Prime Beast Hunters erscheinen. Es kostet $13,49 und wir haben hier schon mal das Cover für euch. Jetzt kommt die Vorschau zum IDW Comic Transformers Prime Beast Hunters Heft 7 für euch. Trotz der Dinobots war die Serie bisher ziemlich langweilg, umso überraschender das ab der Ausgabe 6 es endlich interessant wird (auch wenns nur daran liegt das es ans Ende von Predacons Rising anschließt). Hier haben wir einige IDW Comic Beast Hunters Werbe Comic Scans für euch. 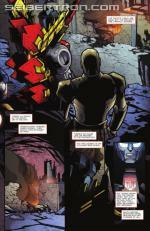 Hier ist die Vorschau zum IDW Comic Transformers Prime: Beast Hunters Heft 8. Jetzt können wir euch einige Seiten aus dem Transformers: Art Of Prime Buch zeigen. Heute haben wir weitere Seiten aus dem Transformers: Art Of Prime Buch für euch. Hier haben wir ein Interview mit Jim Sorenson zum Buch "Transformers: Art of Prime". Va'al - First things first - how did the idea for the Art of Prime book come about? Jim - Well, it was something that I'd been pitching for quite a while, before the show actually aired. I was living in Los Angeles at the time the Prime show had been announced, and one of the people in my extended circle of friends was Christophe Vacher (Visual Effects Art Director on the series). I knew him, and I knew he was working on Prime. I pitched the idea, he seemed interested, we went back to the studios, and nothing really happened for a while. I kept checking with IDW too, who had expressed a vague interest, and I pitched the idea several times. Then around June of this year I got an email from my editor: we're going ahead with Art of Prime! I wanted to do a book about Prime but what made me decide it would be an art book was possibly the actual conversations with Christophe. We both realised Prime wouldn't work in the style of an AllSpark Almanac, the tone of the show is very different. So we decided the book would look at the art, at the process. 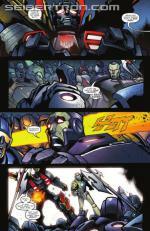 IDW already had a successful product in the Art of Fall of Cybertron book, they were willing to do it again. What I believe is one of the main points about the show is that the stories, characters, acting, they're all good - but what is really outstanding is the visuals! Va'al – Very good point, the visual elements of the show have been acknowledged by many, and won awards all over the place! You've worked on The Ark and AllSpark Almanac previously, and you said you knew that Art of Prime would be different – how so? Jim - Having made the decision that it was going to be an art book focused us, directed us differently. What we were working on with previous books was the story perspective, the characters, the events. With this one, we approached it from a design perspective: in some ways I wanted to get out of the way of the creators. There is very little of my voice in the first half of the book, and that was a conscious decision – I didn't want the readers to read about what I felt about the images. I wanted them to hear from the creators, what they were proud of, what their perspective on the process was. I thought it'd be a lot better to get them to speak. In the first three sections, I let Jose Lopez (Art Director/Characters and Props) talk as much as possible, something that I didn't want to do with the Almanacs, something I possibly would've done with The Ark if we had access to the creators. As it stands, the Prime creators were more than happy to do it, and it was an extra incentive that they were able to do it in their own office, in their own time and talking about their own work. I think the interviews really help the tone of the book – it makes a big impact. Va'al – It sounds like you were really engaged in the work around and about the book. What was your favourite part about putting together Art of Prime? Jim - Definitely getting the chance to work so closely with the creative staff. At this point I've done quite a lot of books, from anthologies to collections, Transformers, G.I. Joe, articles for fan magazines – I find it really exciting to turn raw material into a book. But I've done it before. This time I got a chance to really jump in, go to the studios, see the creators work (they were at work on Predacons Rising at the time). Definitely the highlight of putting it all together. A secondary pleasure was getting to see the animatics for Predacons Rising about three months before anyone else: I contacted one of the producers, as I had a fair bit of material that I couldn't find on the show at the time, so I wondered if it was for Predacons Rising and if I could get a script or something to set it in context. I'm not sure they understood what I was asking for at first, but once they got it they sent the whole thing, with my name watermarked all over it! Va'al - Well, some people just have that type of contacts, don't they? Once you placed all the material you had, was there anything taken out, or things you didn't include? Jim – There was a lot that we just didn't have space for, as it's already a 200-page book. I possibly still have another 20 pages that I wanted to put in, but did not need to get in. I would've liked to have extra pages for Shockwave, the Insecticons, Vehicons. Maybe spend a little bit more time on Silas and Cylas and MECH. I had an extra page for Knockout - no, Breakdown. Knockout was one of the last pages to get finalized, as we only had black and white artwork for the car mode. So I contacted Mathias Dougherty (Production Manager) for a color image, I told him 'It's Knockout, man! He'll kill me if he doesn't look his best! '; he laughed, and set off to look for the gorgeous artwork you now see in the book. So yes, a lot more little things, but nothing that the book can't live without. I'm really quite proud of this one. Va'al – It definitely looks comprehensive, and stunning. But do you think it'll appeal to all fans of the franchise? How would you sell it to a new reader? Jim - Even if you're not interested in art books, the focus for this one is on process. Any Transformers fan, any fan of animation in general will find the process that goes into the creation of a cartoon extremely fascinating, I believe. And it's very rare to have an art book like this for a TV show, you usually only get them for movies. As I said, I'm really proud of the result. Va'al – I've been reading through it, you definitely should be. Thanks again Jim, this was a great quick chat! Any last words? Jim - Thanks for the interest! I really hope you all enjoy the book. 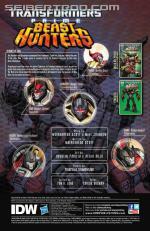 Hier ist die Vorschau zum IDW Transformers Prime: Beast Hunters Vol. 2 TPB Comic Buch. In diesem sind Heft 5 - 8.